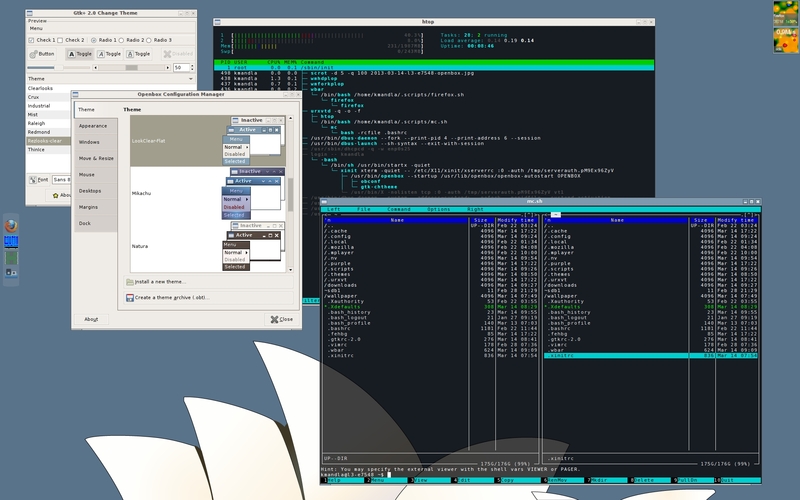 With my sudden allegiance to the tiling window manager team, I felt I ought to give myself one last shot at floating windows. Back to Openbox again, and some classic themes I dragged out of dark corners to apply. For what it’s worth, most of that is intended for the Rezlooks engine, because bloated rounded corners are so very 2008.
wbar is there too though, as are a couple of dock apps — wmhdplop and wmforkplop. Beats me where the wallpaper came from though; I’ve had that for almost a decade, I think. This entry was posted in Linux and tagged screenshot on 2013/03/14 by K.Mandla.